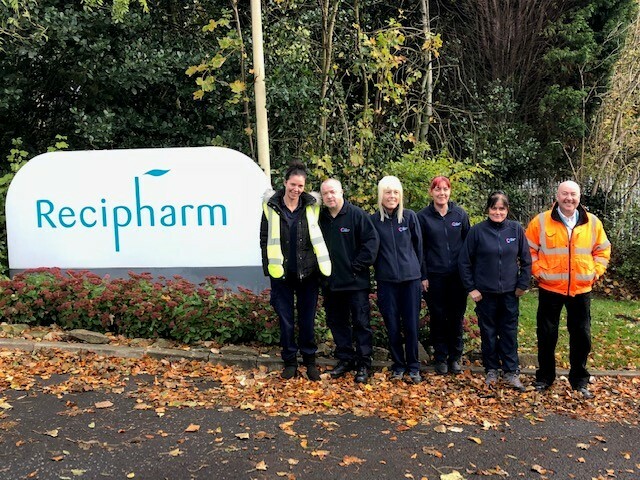 AM Services Group began providing manned guarding services to Recipharm at their Ashton-under-Lyne site in summer 2016 and, thanks to great service delivered by a fantastic team, when the contract recently came up for renewal, the security service was extended – and more! Recipharm delivers broad-scale contract manufacturing of pharmaceuticals, and provides pharmaceutical development services with a range of expertise and technologies. Lesley Adams, Personal Assistant for Recipharm, explained how successful the service has been: “They were very quick to understand our specific needs and pro-active in finding they right type of person to work for us.” As a result of this fantastic work, the security services have been extended for three years and AMSG was awarded an additional contract for cleaning and washroom services earlier this year. According to this very happy client, “Teamwork”, “trust” and “quality” were right at the top of the list when deciding to continue the relationship with the AM Services Group team forward into the future. Since providing the additional cleaning and washrooms services we are delighted to have provided additional specialist cleaning services across the site and look forward to continuing our growing relationship in the months ahead.